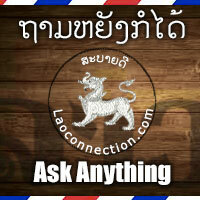 Question: Have those around you always supported your endeavours with Laoconnection.com? Answer: No, not always and not even from my own family and friends. The lack of support is more apparent at the beginning when people were simply unsure about the idea of the site when I told them about it. Then when they see it, their impression changes to something more positive. I'm very enthusiastic about Laoconnection.com so I'm sure that adds to it too. Enthusiasm can be infectious. And when someone doesn't quite get or understand what I'm trying to do, I don't take it personally. I've come to accept that one person's interest may not necessarily be the interest of someone else's. Of course it's always nice when you have the support of those around you. However, at the end of the day you also come to realize something very important - that your own inner strength, drive, and desire to get it done comes from within and not from outside. I never felt I needed outside encouragement to work on Laoconnection.com. It was just something I simply enjoyed doing. Nowadays, I do admit that family and friends are quite supportive. They follow the blog and FB Page, and send in ideas and comments. It's really nice. The other support that's quite positive is hearing from visitors. It's always nice to hear feedback, suggestions, ideas and different perspectives.